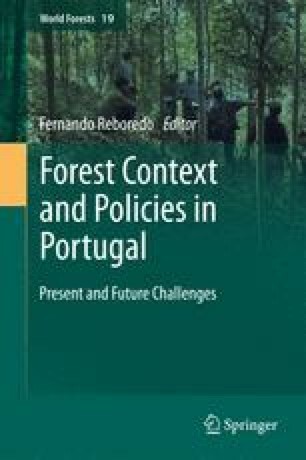 An overview of pest and disease problems in the main types of Portuguese forest is presented. Native pine forests, mainly Pinus pinaster and Pinus pinea have been occasionally affected by native bark beetles, cone feeders, one defoliator (the pine processionary moth) and a few fungi. Thus far, problems with these native pests and pathogens, arise mostly during outbreaks or epizootic periods. In most cases they are associated with poor forest management, fires or drought stress. Nevertheless, some alien pests and pathogens have recently become reason for concern, namely the pinewood nematode and Fusarium circinatum. Mediterranean forests composed of evergreen oaks, namely Quercus suber and Quercus ilex, were in the past mainly affected by defoliators such as Lymantria dispar and Tortrix viridana. During the second half of the 20th century, oak decline increased and was attributed to drought stress, together with a complex interaction of biotic agents. Fungi in the genera Biscogniauxia and Diplodia, the Oomycete Phytophthora cinnamomi together with bark and wood borers, in particular Platypus cylindrus, were associated with the most serious cases. For more than a century the exotic Eucalyptus forest plantations were free from pests and pathogens. However, they are currently threatened by increasing numbers of pests and diseases mainly originating from Australia. Some of them cause severe damage and compromise productivity. For all these forest ecosystems, health problems are expected to be favoured by climate changes and new biological invasions, implying that efforts should be made to develop new control strategies to combat future threats.